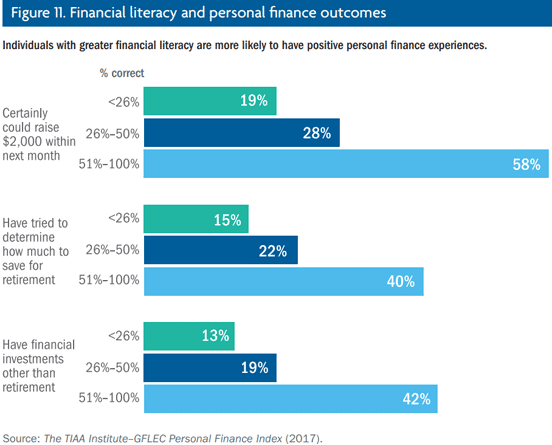 In a Nutshell: As part of its commitment to the development of a financially literate world, the Global Financial Literacy Excellence Center, or GFLEC, teamed up with the TIAA Institute to conduct a Personal Finance (P-Fin) Index survey to measure the financial literacy of adults living in the US. This comprehensive survey intentionally oversampled the Hispanic population to better understand the challenges faced by this rapidly growing segment responsible for close to 12% of America’s GDP. The results showed that Hispanic adults answered 40% of the survey questions correctly, compared with 49% for all US adults. A deeper look found that US-born Hispanics answered 44% correctly, compared with just 36% for foreign-born Hispanics. This disparity highlights a need for targeted education that will address the specific requirements of different demographics within our society. Perhaps not surprisingly, financial literacy in the United States does not even receive a passing grade. At least those are the findings indicated in a recent survey jointly conducted by the Global Financial Literacy Excellence Center (GFLEC), and the TIAA Institute. GFLEC, part of the George Washington School of Business in Washington, DC, was founded in 2011 with the purpose of promoting financial literacy around the world. 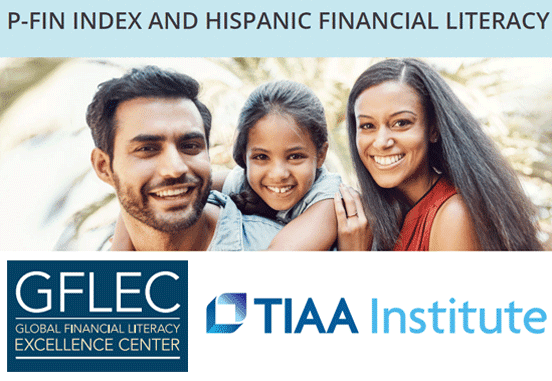 The TIAA Institute – GFLEC Personal Finance Index was developed to assess the state of financial literacy among US adults. In 2016, it examined the financial awareness of 1,043 participants, with an intentional oversampling of the Hispanic population. The purpose was to measure the level of knowledge and understanding that enables sound financial decision-making and the effective management of personal finances. 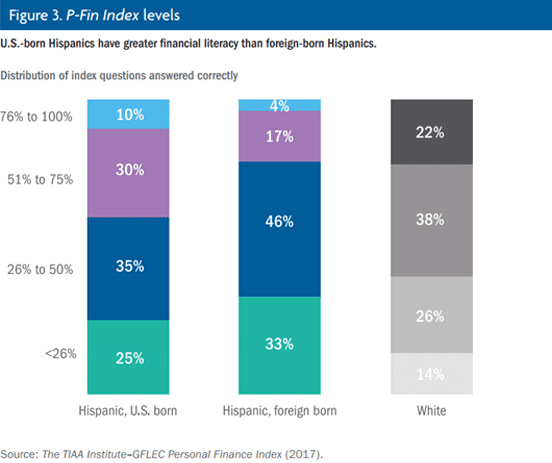 The GFLEC and TIAA Institute co-sponsored the TIAA Institute – GFLEC P-Fin Index, which provided valuable insights on the differences in financial literacy between US-born and foreign-born Hispanics. US Hispanics are of particular interest to GFLEC because they are one of the fastest-growing segments of the country’s population and have been identified as key to the country’s economic growth. The US was home to 58 million Hispanics in 2016, accounting for one-half of the nation’s population growth since 2000. As a group, Hispanics contributed more than $2 trillion to the US gross domestic product (GDP) in 2015. By 2020, US Hispanics will fuel nearly a quarter of all US GDP as more baby boomers retire and a growing number of young Hispanics join the workforce, according to a 2015 Latino Futures Research study. Understanding the financial literacy levels of this group would be of the utmost importance in designing programs to serve this emerging demographic. We recently sat down with one of the study’s authors, Andrea Hasler, Assistant Research Professor in Financial Literacy at GFLEC. We wanted to know how the survey was conducted, and what it could tell us about the state of financial literacy among Hispanics in the US. The results of the survey showed that the US adult population, as a whole, was able to answer 49% of the survey questions correctly. When broken out demographically, however, Hispanics were able to answer just 40% correctly. Viewed in even closer detail, the survey revealed that US-born Hispanics answered 44% of the survey answers correctly, while foreign-born Hispanics were able to answer only 36% correctly. GFLEC researchers were particularly interested in the nearly 25% disparity between US-born and foreign-born Hispanics, and we asked Andrea to help us understand what might explain it. If access to education and higher-paying jobs is indeed a contributing factor to financial literacy, it stands to reason that US-born Hispanics may have an advantage over someone who has recently arrived in the US. Andrea explained that approximately 55% of US-born Hispanics who completed the survey had attended college, while only 25% of foreign-born Hispanics participating in the survey reported having a higher education. One of GFLEC’s primary goals is to develop and promote financial literacy programs, and understanding that the two groups have different needs is vital to accomplishing this mission. The difference in the level of financial literacy between US-born and foreign-born Hispanics will require programs that address their specific needs to drive better results for both groups. Financial education programs should be designed so they match a person’s level of understanding. It serves no purpose to discuss the benefits of compound interest with someone who doesn’t understand a savings account. Targeted financial education programs can and must meet people where they currently are. Increasingly, governments around the world are providing less financial security for their populations, at a time when financial literacy is at near-crisis levels. If people are being asked to take more financial responsibility for themselves, then education about financial matters has never been more important. The economic importance of US Hispanics continues to grow as their numbers increase and their demographics evolve. As of 2016, US Hispanics had a purchasing power of $1.4 trillion, according to the report. However, gaps still exist among the Hispanic population in terms of the level of wealth, income, and even integration with traditional financial institutions. Less than 50% of US adults are considered financially literate, according to survey results. The US can only fully achieve its economic potential by raising the financial literacy levels of all members of society. Improving financial awareness and knowledge can lead to improved living conditions for all Americans.